Actor Thomas Camilleri who features in the advert. Costa Coffee has thrown its hat into the ring of Christmas adverts, with a heart-warming ad literally bursting with the magic of Christmas. 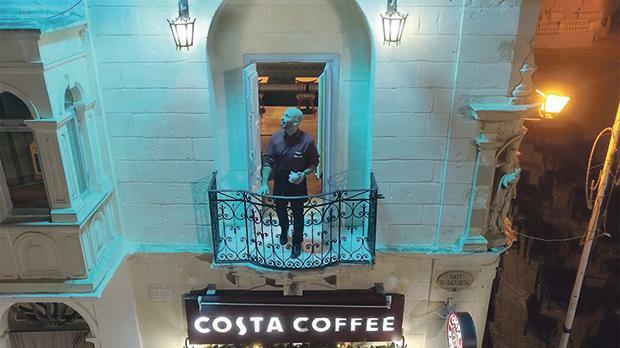 Set in the cosy Marsaxlokk branch of Costa Coffee, the advert follows the story of a hard-working Costa barista who must make a last-minute dash after closing on Christmas Eve to buy a cuddly gift for his little daughter. When a mysterious man arrives to enjoy a warming hot drink and snack just before closing time, the barista loses hope, but this magical customer is not all that he first appears… Featuring well-known local actors Thomas Camilleri and Barry Calvert, the beautifully-shot festive advert was developed and filmed by media production house Three Wise Men, based on a concept by Yanis Azzopardi, Costa Coffee Malta’s marketing manager, and Reach Marketing. Costa has also launched its highly-anticipated seasonal menu, to boost the warm, magical feeling of Christmas even further. With seven new comfortingly Christmas-inspired drinks, including gingerbread latte, hazelnut praline latte, doughnut latte, white hot chocolate, caramel cookie hot chocolate, indulgent hot chocolate and indulgent hot caramel, it’s not hard to see why Santa would choose Costa for his coffee break on a chilly Christmas Eve! This Christmas, one can experience the magic of Costa and indulge in a seasonal drink shared over magical conversations. And you never know – the next person to arrive may be more magical than one expects.